For ANY Leica M mount camera! The rangefinder coupled M mount 25/4P and the scale focus screw mount 25/4 Snapshot side by side. 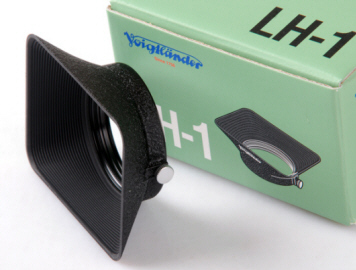 The square LH-1 lens hood is optional. Remove the standard round hood to mount it. Released May 2007. The 25/4 P has the same optics as the previous 25/4, but is now rangefinder coupled for more accurate focusing. This lens works on any M mount camera, but is also very convenient on the new Bessa R4A or R4M. A viewfinder is not included with the lens. The 25/4P in Leica M mount lens brings up the 35/135 framelines in Leica M film cameras, or the 35/24 frameline on the Leica M8. 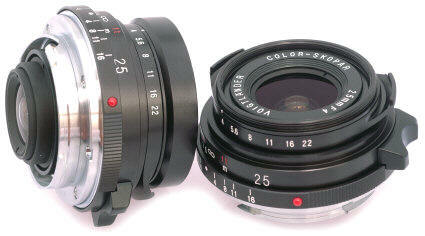 The lens is styled similar to the Leica 35/2 pre-aspheric Summicron. The optional square LH-1 lens hood will fit the 25P, but the LH-1 is not suitable for the R4's as it blocks too much of the viewfinder. The lens is supplied with a 39mm snap on front lens cap. The 25P has 7 lens elements in 5 groups, 39mm filter size, apertures f/4 to f/22 with click half stops, nearest rangefinder coupled focus .7 meter, scale focusing from .7 meter to .5 meter, diameter 55mm, weight 144 grams, with a field of view of 82 degrees. In 2010 two new 25 mm finders were introduced: a metal combination 21/25 viewfinder using improved optics for a clearer, brighter image at $209 (chrome or black) , and a combined 21/25 viewfinder using the older optics and the plastic bodied viewfinder finder (black only) $169. On top of that, the new 15-35 Zoomfinder was introduced $529. Mr. Kobayashi enjoys quality viewfinders!